Get a subscription to Take A Break's Take a Crossword magazine, it is Britain’s best-selling crossword magazine – and no wonder. Every issue in a Take A Break's Take a Crossword magazine subscription is crammed with top quality crosswords, ranging from five-minute quick crosswords to general knowledge puzzles and cryptic challenges. 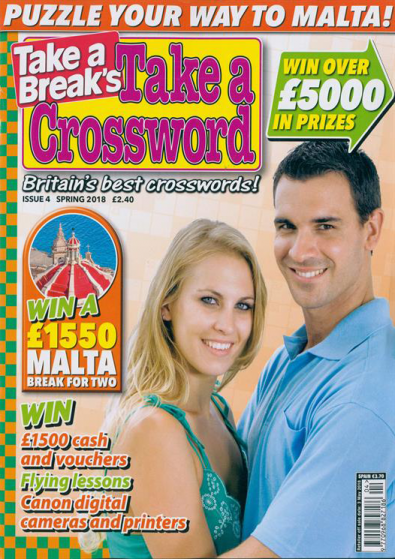 With a subscription to Take A Break's Take a Crossword magazine you also get over £5,000 in prizes with every single issue. All in all, a subscription to Take A Break's Take a Crossword magazine is the perfect mix for the crossword fan. This a fantastic Magazine...packed full of great crosswords and puzzles, brillliant for chilling out with a nice cup of tea. The iSubscribe subscription is great, magazine is devlivered on time every month. This is published 13 times per year, please allow up to 6-8 weeks for your first delivery. Your subscription will begin with the next available issue.